Tyrannosaurus was so named because it was terrifying. As a child, we were glad that they had gone extinct because we didn’t fancy being chased and eaten by one. But since my childhood, scientists have been continually attempting to play down the fierceness of Tyrannosaurus Rex. One childhood game that I remember well was long bacon. We used this to irritate our friends, or to insult our teachers, without them knowing. The game involved placing our thumb on our nose and wiggling all the other fingers around while sticking our tongue out. We already know that T. Rex’s feeble arms wouldn’t reach its great nose, but now we find out that it probably couldn’t even stick its tongue out. We have long thought that dinosaurs were sort-of lizard like and, therefore, probably stuck out forked tongues, as many lizards do today. But crocodiles do not stick out their tongues. Instead, crocodiles and alligators have tongues rooted to the bottom of their mouths. 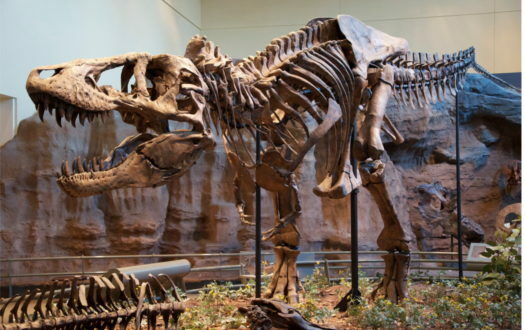 Scientists at the University of Texas at Austin have been looking at high-resolution images of dinosaur skulls and suggest that hyoid muscles and bones – the ones that anchor and move the tongue – indicate a fixed tongue for many types of dinosaurs, including T. Rex. It probably takes few by surprise to realize that birds also usually have these sort of fixed tongues. However justified the research might be, it is led by an unjustified a priori commitment to “proving” the evolution of dinosaurs into birds. Prayer: We love the mysterious dinosaurs which You created along with us. Thank You for scientists who conduct serious study into them. We know that You created them, Lord, so we look forward one day to finding out where they went. Amen. Ref: University of Texas at Austin. “T. 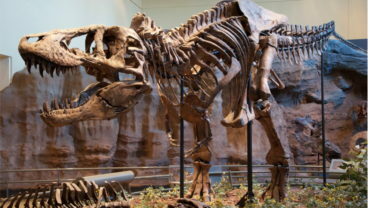 Rex couldn’t stick out its tongue.” ScienceDaily, 20 June 2018. ww.sciencedaily.com/releases/ 2018 /06/ 180620150129.htm>. Image: CC BY-SA 34.